HOSPITALITY AS WARM AS THE AZ SUN! The beautiful setting is a perfect backdrop for dramatic sunrises and sunsets. 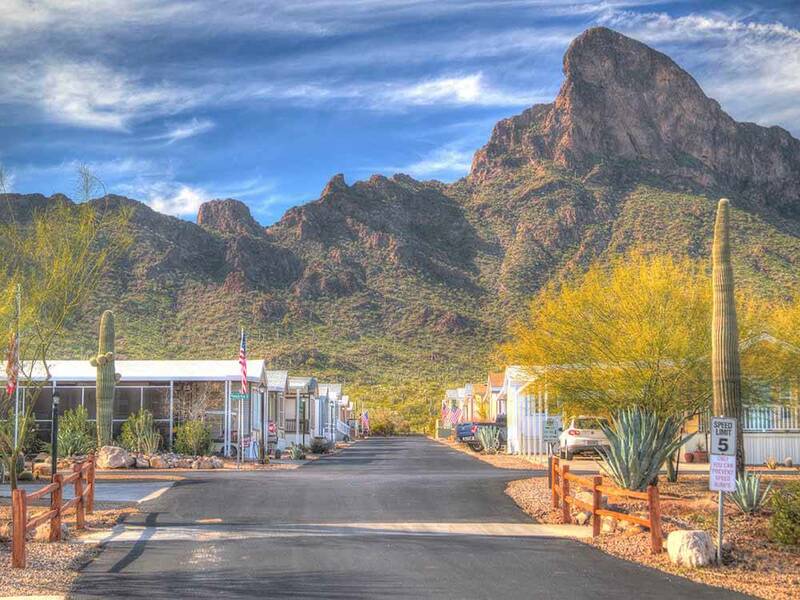 The local area includes national parks, Pima Air & Space Museum, Sabino Canyon, Casa Grande Ruins and more. Relax in sunshine year-round. Greeted very warmly when I arrived and I was assisted to my site for the night. Very clean and easily accessible with my 42 ft 5th wheel. Pet friendly also. I would definitely stay here again. This park deserves the high ratings awarded by Good Sams. We stayed two nights in the Big Rig pull thru sites. Wide Spaces and the park is easy to get around. Each site has a concrete slab ,picnic table and privacy fence. Great scenery with the mountains nearby and hiking trails if you choose to get outdoors. We liked the fact that the park was gated. Nice knowledgeable staff. Two negatives- the park is pretty far from shopping (you either go 45 miles east to Tucson or 25 miles west to Casa Grande) and there is a lot of highway noise from Interstate 10 and trains pass thru all night long.